Here is a question posed by the New York Times columnist David Brooks, in his column published on Tuesday, January 8, 2019. Brooks' column was titled, "Washington's New Power Structure." There’s one question ... I’d like to ask of practically every member of Congress. Why are you so dispossessed? Now, that is a good question, David! On January 31, 2018, I pretty much asked the same question, though I posed the question to each one of us, individually, in our capacities as citizens of a democratic country, and thus persons in whose hands governmental power is supposed ultimately to reside. I had an answer to my question, as well, and it may be that this same answer would provide a correct explanation for what puzzles Brooks. 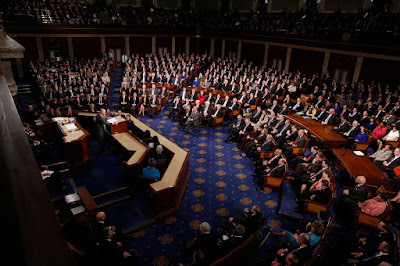 He wants to know why Members of Congress aren't really trying to deal with the nation's problems, even though they are, of course, officially designated as the persons who are supposed to represent the citizens who elected them, and who are thus supposed to serve as the mechanism by which we, the citizens, achieve self-government. I tend to think that one reason we do not assert our democratic control over our government more than we do is because we would prefer not to be implicated in any admission that we are in charge of what the government is actually doing. It does require courage to assume responsibility for the way things are - and then to assume responsibility for trying to change things, when things are unacceptable. Dylan's lyrics are a poetic way to convey just this point. If "Eden is burning," then we need to have the courage to try to change the unacceptable realities we confront. We will need courage to insist upon a "changing of the guards." Politically, courage must always come from the "bottom up" (that means us, folks). Eden is burning, and if we lack courage now, then Dylan tells us exactly what to expect. David Brooks' column and Bob Dylan's insights: same message!